In 19th-century China, two seven year old girls are matched as laotong (old sames), and bound together for eternity. 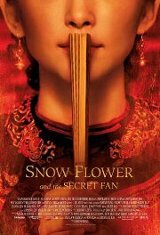 Isolated by their families, they furtively communicate by taking turns writing in a secret language, nu shu, between the folds of a white silk fan. In a parallel story in present day Shanghai, the laotong's descendants, struggle to maintain the intimacy of their own childhood friendship in the face of demanding careers, complicated love lives, and a relentlessly evolving Shanghai. They try to decipher the secrets written in the fan by their ancestors.